San Michele Pilgrimage Shrine consists of the original Sanctuary of the Archangel Michael in a grotto and the crypt and devotional museums. It's easy to find the shrine as the octagonal bell tower, built in the 13th century, rises above the town of Monte Sant' Angelo on Puglia's ​ Gargano Promontory. From the small square by the bell tower, pilgrims and tourists pass through the Gothic arches of San Michele to an information booth and ticket office for the crypt. Descending the long stone staircase constructed in the 13th century (or elevator for the disabled), visitors arrive in the nave with frescoes and murals and a small bookshop. On the Bronze doors, made in 1076 in Constantinople, are 24 panels depicting Bible scenes. The doors lead to the cave of Saint Michael. The Sanctuary of the Archangel Michael, or San Michele, in the grotto dates from the 5th - 6th centuries and is the site where devotion to the Archangel Michael began. The original grotto of San Michele is said to have been consecrated by the archangel and is the only church not consecrated by human hands. Guests can visit the grotto free of charge by sending an email to info@santuariosanmichele.it or calling +39 0884 568127 for a reservation. Mass is still celebrated here and visitors are not allowed in during mass. Visitors should dress appropriately for entering a church and be respectful of those using it as a place of worship. Also in the Sanctuary Crypt are the interesting devotional and lapidary museums that can be visited by reservation as above. The Shrine is on the ancient Via Sacra Langobardorum, connecting important Longobard sites, now a UNESCO World Heritage Site. 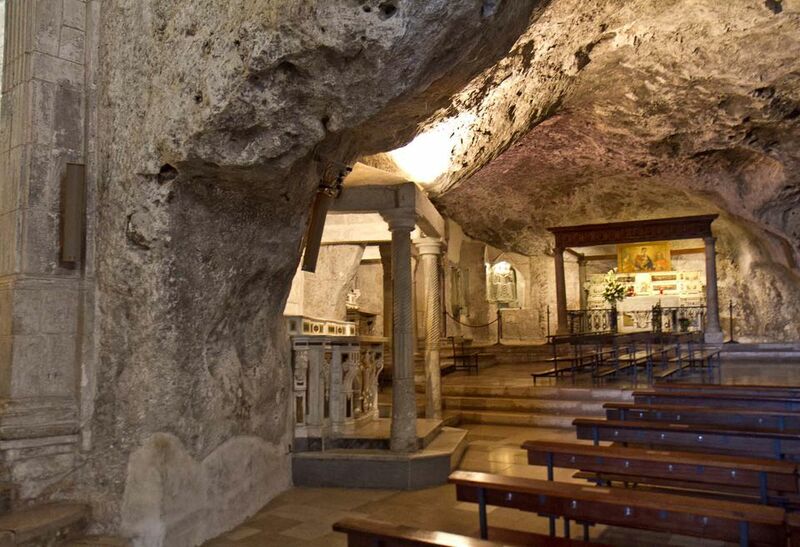 It's also a major stop on the Pilgrimage route for devotees of the Archangel Michael that connects Mont St Michel in France, La Sacra di San Michele Monastery in Piemonte and San Michele Sanctuary in Monte Sant' Angelo. In the middle ages, pilgrims often continued on to Jerusalem by boat. Under Basilica San Michele near the Sanctuary of the Archangel Michael grotto are two interesting museums - the lapidary museum in the crypts and a religious or devotional museum. Serving as the entrance to the sanctuary from the late 7th through 13th centuries, the crypts under the basilica floor now house the Lapidary Museum with artifacts from the Byzantine and Longobard periods, dating from the 7th through 15th centuries. On the walls, inscriptions from ancient pilgrims, including some who came during the crusades in the middle ages, are still visible. Arrange a visit to the crypts at the entrance of Basilica San Michele as they can only be visited with a guide. The devotional museum houses items related to Saint Michael Archangel, many of them gifts to the sanctuary from pilgrims in thanks. There's a collection of coins and medals dating as far back as the third century BC, archeological exhibits, and more recent items related to Saint Michael including liturgical objects, paintings, icons, and statues. The devotional museum can be visited without a guide and there's a suggested donation of two euro. Both museums and the Sanctuary are open by reservation only. Email info@santuariosanmichele.it or call +39 0884 568127 or contact the tourist office (Pro-loco) near the Sanctuary for information. Visitors are requested not to enter the grotto sanctuary during mass. Check for updated times and prices on the San Michele web site.